This article was written about the 25th anniversary of the Duke Program for Manager Development in Russia, which is no longer in Fuqua's suite of offerings. It was a night to remember a defining moment that impacted the lives of many in both Russia and the United States. 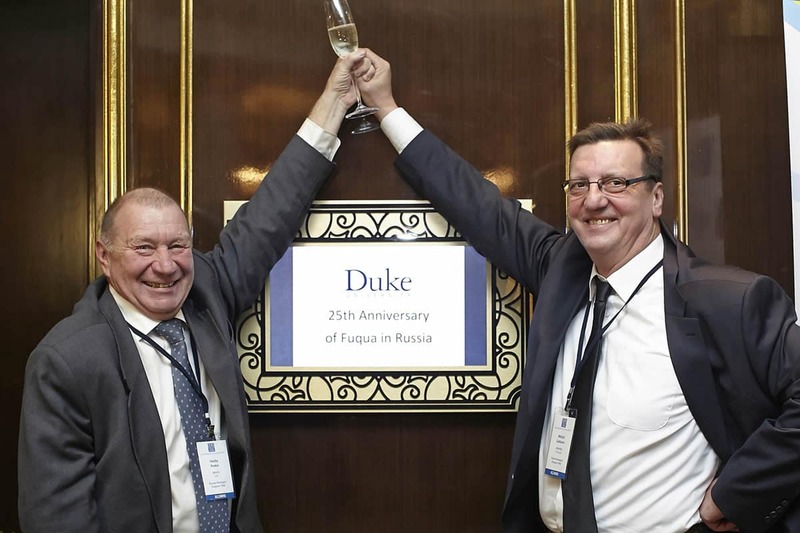 About 80 people gathered for a celebration in Moscow hosted by Duke University’s Fuqua School of Business to mark the 25th anniversary of the school’s involvement in Russia. Most of the crowd was alumni who graduated from Fuqua or other Duke programs, and there were a number who completed the Duke Program for Manager Development in Russia—an initiative that began Fuqua’s engagement in the region in 1989. Guests socialized and dined while being treated to presentations about Fuqua’s current involvement in Russia and the CIS from Regional Director, Daria Zarubina, and a talk from Dean Bill Boulding that echoed Keller’s sentiments about the program for Russian managers. “This was the turning point for the university where we decided that if you wanted to be a great business school you had to be a great global business school, and so we went out into the world to build connections to places in the world that are, and would be, critical to the global economy, “ Boulding said.